The D-Shad is a new breed of soft plastic jerk bait. 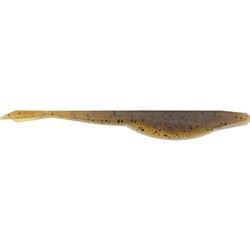 It has a streamlined body designed to give that side-to-side twitching action, but the tail is thicker and heavier so when you kill the bait it sinks level and gives a little shimmy. It will work great by itself weighless for twitching, but also give it a try on your Carolina Rig, or behind your “Chatterbaits” or “Scroungers”. However you use the new D-Shad you are sure to catch them!